The Happy Trails Bicycle Club’s mission is to promote a healthy and active lifestyle through cycling, encourage participation in group cycling and promote bicycle safety through education. By joining our organized rides, you will learn to ride safely in a group. Each week, we have one organized ride within the resort and two organized rides outside the resort. 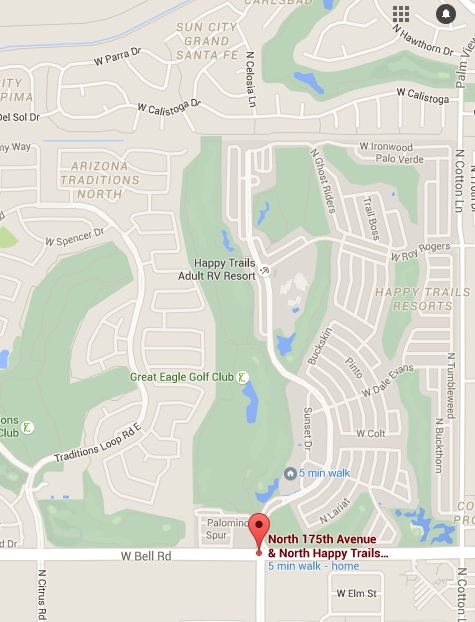 During the season, we plan a couple of longer rides on the New River Trail or on other bicycle trails in the Greater Phoenix area. We've even gone on multi-day rides. Experienced riders are welcome to ride with the organized bike group in Traditions, our next door neighbors. This group has daily 40 mile rides at a brisk pace of 16 to 18 mph. Visit the Happy Trails Bicycle Club official website. Group ride to beautiful Sun City Grand Cafe. A favorite is a social ride to Jim's Burgers. We find several neighborhood parks for breaks. This one is the Sun City Grand Ball Fields. A group ride on the New River Trail. 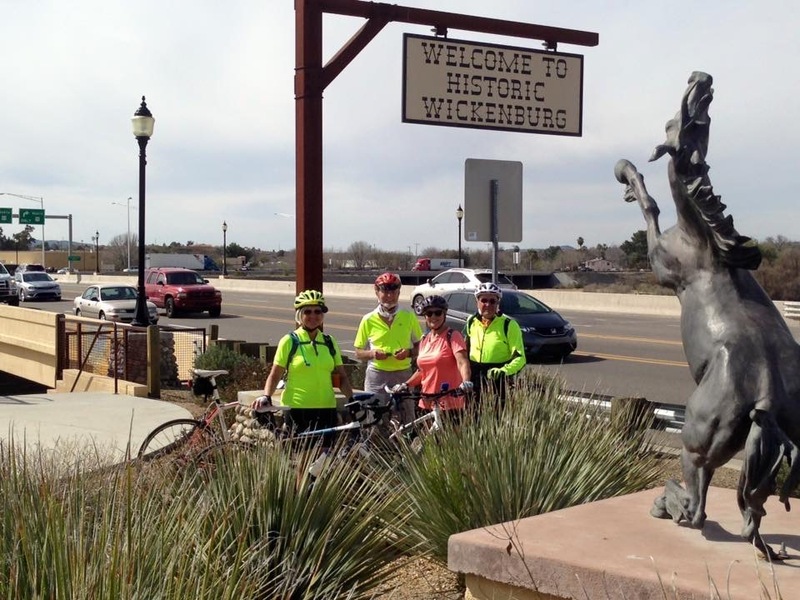 In March, 2017, some of the experienced riders rode to Wickenburg on a 2-day ride of 70+ miles. Valentine's Day lunch ride bunch. We love a ride to the Waddell Hacienda to see the rescue horses. We often see peacocks, goats, sheep, pigs, dogs and a big turtle. When we arrive in our bright colored shirts, the horses will come to the fence for some apples and carrots.